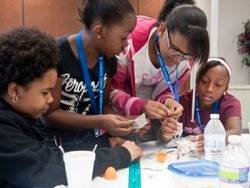 Huntington Ingalls Industries' Newport News Shipbuilding division partnered with Newport News Public Schools to host the first Egg Drop Engineering Competition for middle and high school students. The event was sponsored by the NNS Career Pathways program. Egg drop competitions were held at all of the Newport News high schools and middle schools throughout the school year. About 70 students representing the winning teams from each school faced off to determine the overall egg drop champion. The teams created capsules using materials such as paper cups, cardboard, newspaper and tape to hold their eggs. The middle school teams' eggs were dropped 12 feet onto asphalt; the high school teams' eggs were dropped 18 feet onto asphalt. In addition to being judged on the integrity of the egg following the drop, students were judged on their team presentations describing the materials they used and how career readiness skills such as teamwork, communication and positive attitude helped to build their capsule.